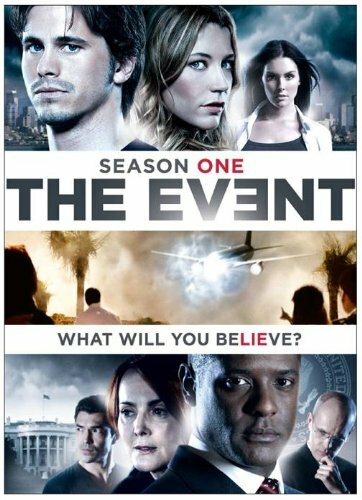 Quick Take: The Event, "I Haven't Told You Everything"
Review: The Event, "I Haven't Told You Everything"
(S01E01) At first glance, this show really could have sucked and during the first few minutes I really thought it would. It all begins with an annoyingly cliché: a shaky-camera-with-people-screaming scene (a la Flash Forward or V). Then, the story cuts back in time to a nervous looking man on a plane followed quickly by a series of flashbacks revealing the nervous man's back story (a la Lost) and seemingly unrelated government secrets (again, Flash Forward or V). But somehow underneath all of those tired plot devices, the underlying story still seeps thorough and has something to offer. Slowly but surely, we begin to find out more about our main character, Sean Walker (played by Jason Ritter -- yes he is the son of John Ritter) and even -- gasp! -- begin to care about him. It turns out he's a nice guy (or seems to be) and just wants to marry his girlfriend. Then the annoying flashbacks continue and we meet President Martinez (played by smooth, handsome Blair Underwood) just as he learns about a plot to coverup a weird Guantanamo-type holding facility in Alaska. As additional layers of the story are revealed, these two disparate storylines merge in a really cool way just at the last few seconds of the show. I'm purposely being vague here, because if I say anymore it will kind of ruin the whole thing, but suffice it to say, when we find out what our nervous man Sean is trying to do on the plane, more questions are raised, some cool scifi-ish questions at that, and after the episode is done, we're left scratching our heads and wondering just what the heck happened. Just caught up on this premiere and my feelings are similar to yours. Especially after suffering through Chase, I felt there was enough intrigue by the end of this pilot to justify another go round. I'm not necessarily locking in for the long run though -- there needs to be enough character development and a consistently well told story to keep me around. I'm hoping future episodes don't rely so heavily on flashbacks because that could get annoying very quickly. Yes! I found myself imagining a comedy sketch at one point that does flashbacks and forwards to some absurd extent while watching this. If the flashbacks continue, they'd better darn be worth it is all I can say. We've seen enough flashback-heavy shows to know when it's done right and when it isn't. Well, I want to see what happens beyond ep 1. I guess that's saying Monday night's offering definitely had the intrigue. Can't wait to know the Dad's story. I think that the flash back and flash forwards added to the mystery surrounding the plot. The Dad's story is that he is trying to save his daughters. They did not show what happened to the little girl. The scifi element is intersting. We will see if the show gets more intersting or bombs. I'm not so worried about how effective the flashbacks are at the early points of the series, but I AM concerned if it becomes a crutch.